I have had a copy of My Father's Dragon for the longest time. 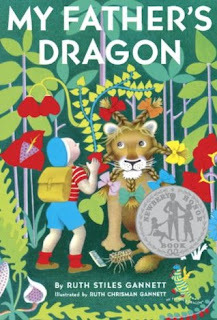 It was one of my favorite books I remembered reading growing up, and I have read it to each of my children multiple times. It wasn't until a few years ago, though, that I even realized it was a trilogy. I went to buy a replacement copy and came across the other 2 books. So I bought all three in the compilation book: Three Tales of My Father's Dragon. After reading the other two, I have wished ever since that I had just stuck with the original. It is by far the best of the three. This preference is reflected in my reading aloud. I've read the first one to them many times; the second and third? Maybe once or twice each. They seem to like the others okay while I read them, but they don't request them. 5 stars: A sentimental favorite! Elmer Elevator meets an old alley cat who tells him a fantastic story. There's a baby dragon that has been captured on Wild Island and used as transport across the river for all the animals. As Elmer is unhappy with his mother anyway (she doesn't like old alley cats), he decides to run away to rescue the baby dragon. The alley cat is the only explorer ever to visit the island and leave alive, so he makes the perfect advisor for Elmer as to what to pack for the trip. He makes his way to the island and ends up using all the things in his pack to outwit the wild ferocious animals. I've read this one to my children many, many times. Most recently, my 5 year old asked me to read it to him. I know he has been around for previous readings, but he was younger, so may not have been paying attention. It was just as much fun for him as it has been for the rest! There's something very satisfying about having the list of all the things in the pack, and then seeing how each item is used--in different circumstances that you might originally expect. For kids who are counters, keeping track of the tangerines is also enjoyable. In addition, there's a delightful, subtle humor throughout the story. One of our favorite characters is the mouse with the speech impediment. The illustrations round it all out perfectly. 3 stars: Quirky and enjoyable in its own right. 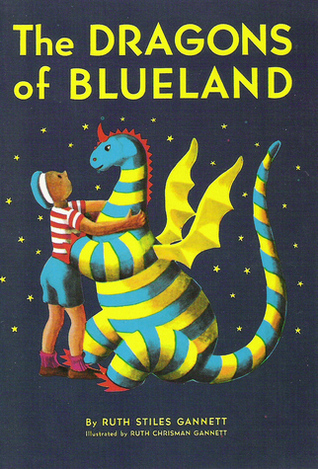 Elmer and the Dragon are headed back to Popsicornia, to take Elmer home, when the little dragon's wings just give out. Unfortunately, they are flying over the ocean at the time. Fortunately, they happen to land on a submerged sandbank and are able to make it over to the nearby island once the tide goes out. They find themselves on Feather Island, where all the escaped pet canaries go--including Elmer's! As they find out, the canaries all dying of curiosity--eventually--due to a secret kept by generations of the canary kings. 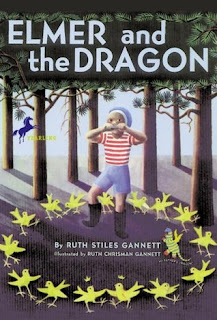 Elmer and the dragon are able to help solve the mystery; (having hands is a big help), which cures all the birds of their dreadful disease. Well, this was no My Father's Dragon, but it was a funny little story that made a decent sequel to Elmer's adventures from the first book. My 5 year old quite liked it. I thought the canaries were a nice touch. The "mystery" wasn't much to speak of, but hey--there was treasure, so that made up for a lot. Elmer's parents were happy to have him home again and didn't ask too many awkward questions, so I guess all's well that ends well. 2 stars: A bit tired. Boris--that's the dragon's name--drops off Elmer at home, then starts his own journey home to the Mountains of Blueland. After nearly getting caught by a determined farmer, he manages to make it across the desert and to the mountains, only to discover that there are hunters keeping his family captive in a cave. The men don't look like they're going to leave without taking some dragons with them. Boris knows a secret entrance the cave, so he sneaks [almost all the way] in and tells his family to sit tight--he will go for help. Who does he get to help? Why, Elmer Elevator, of course! Elmer soon packs his bag with a few essentials for making a ruckus, and off the two go to save the day. This is my least favorite of the trilogy. There are some plot points that don't make sense: Boris makes his way home very slowly with a few close calls with humans, but when he's going to and from picking up Elmer, he manages the journey much more quickly and easily. Also, why doesn't the dragon family blow a little fire (just enough to singe the men--they are nice dragons, after all) and scare them away? Mostly, though, it's boring. As I said, the longest part of the story is Boris' journey home the first time. Then there's several more pages of picking up Elmer and going back, then the big climax comes and goes within just a couple of pages. Reminiscent of the first book, Elmer packs specific items in his bag, but instead of each item having an unusual and charming purpose, they all basically have the same purpose at the end, which is easy to guess and promptly executed. I will say my 5-year-old seemed to enjoy it as much as the other two. Have you read this whole trilogy? What was your take on the last 2 books?